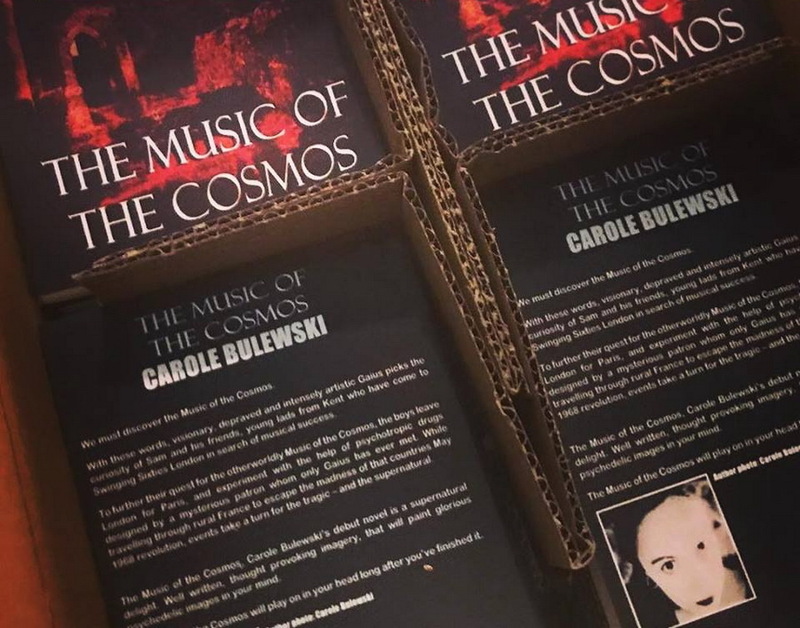 Carole Bulewski debutta da romanziera con The Music Of The Cosmos (Kensington Gore Publishing, 2018), un racconto fantasy dalle tinte horror che flirta con lo psichedelico e il soprannaturale, muovendo dalla scena musicale della Swinging London alle turbolente vicende della Parigi sessantottina, incrociando nel contempo molti eroi della cosiddetta scuola di Canterbury e anzi tirandoli in ballo con nome e cognome direttamente nella trama. La titolazione dei capitoli è quasi una playlist, prendendo da Wilde Flowers (Memories), Soft Machine (Why Are We Sleeping?, Love Makes Sweet Music, Hope for Happiness, Plus Belle qu’une Poubelle, Feelin' Reelin' Squealin' e Moon in June), Kevin Ayers (Joy of a Toy) e Robert Wyatt (Sea Song e Rock Bottom). C'è un breve video promozionale su Vimeo e una festa per il lancio del libro in programma tra qualche giorno al club londinese The Others. L'autrice intanto confessa su FB fatiche, ansie, attese e insospettate coincidenze, e in merito all'ispirazione per il libro dichiara: "I was reading an interview by French director Claude Lelouch, who was recounting driving from Paris to the Cannes Film Festival in a rented car at the time of the events of May 1968, when the entire country was paralysed by a general strike. I had this first idea of a group of friends going through something similar. In my mind, something was always going to go wrong at some point during the journey, preferably in a remote part of the country, and there would obviously be a supernatural element to it. The group of friends rapidly transformed into a group of musicians, and I made the connection with the music of those times, which happens to be my music of choice: Soft Machine and the Canterbury Music. Or, as the friends who first introduced me to it call it: the Music of the Cosmos."